I’m spending this weekend traveling for my sorority, Gamma Sigma Sigma National Service Sorority, Inc., which is giving me pause to consider this aspect of my identity and experience. I am proud to be a member of this organization, and since joining in 2007, I have been given many opportunities to embody and espouse our ideals of Service, Friendship, and Equality in my personal and professional endeavors. As a member of the National Board of Directors, I have the wonderful opportunity to travel and visit chapters in my region, working with outstanding students from many colleges and universities and giving back to my organization by volunteering my time and skills. I am a dedicated member of an alumni chapter, in which I learn and serve alongside women from different generations who share my values and the bonds of unity in service. I’m starting the exciting adventure of advising a reactivating group at UConn, and their newfound excitement and enthusiasm fills me with joy and pride. Anyone who knows me will tell you that I love Gamma Sig. 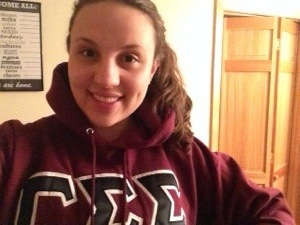 When I travel for the sorority, I wear letters. I carry a bag with letters on it, I wear my sweatshirt or jacket. It’s pretty important to represent my organization when I’m doing our work (at the very least, it helps members I haven’t met pick me out when I’m wandering aimlessly around the parking lot on their campuses). But when I’m in an airport, or a hotel lobby, I feel like my letters take on a new significance, that I become my letters, and consequently, whatever the beholder assumes about them. I will be the first person to tell you that you never really take your letters off. I am a representative of Gamma Sig, til death do us part (literally). And I have no problem with that. But out there in the world, off of the college campus, my letters may mean something different. Admittedly, I’m self-conscious about this. I constantly think “okay, that person is looking at me and thinking ‘sorority girl’, what are they thinking about me?” And let me tell you, the answers in my head are a veritable onslaught of internalized sexism, stereotypes, and assumptions. I often feel the need to clear up misconceptions when the topic of being in a sorority arises. I explain what the organization is, that my role is that of an alumni member working with the national office, and mostly, give my elevator speech. I believe that my experience of insecurity around my identity as a sorority woman intersects with my identity as a young professional in student affairs and the attendant anxieties that come with being mistaken for an undergrad nearly every day, rather than being seen as an educated and competent educational administrator. Most people my age don’t mind being confused for a college student. It’s really within the realm of possibility that I would be a college student, in fact. But think of it this way: if you were a high school teacher, and people constantly asked you what grade you’re in, it would eventually get to you. At the end of the day, I want to been seen as a legitimate, educated, respectable individual. Moreover, I want to be seen this way as a member of a sorority, not in spite of it. I fully and completely realize that “sorority member” is not exactly an historically oppressed identity, and that I carry my visible white privilege prominently and at all times. But I really do believe that this has something to do with how women, and particularly young women, are seen in our society. The assumptions about sorority women are inextricably tied to the lack of value given to young women, to the objectification of our bodies, the devaluation of the ways we are socialized to interact and relate, and the hijacking of our dreams and aspirations by expectations of marriage and maternity. The choice to join an organization that requires service, leadership, and communication is an experience that adds value for college students. We wear our badges and our letters proudly as signs of commitment and honor, knowing the hard work that we have invested in improving the campus, community, and the experience of other students. Greek letter organizations encompass a wide variety of organizations and experiences, each with a history and purpose. And each individual wearing those letters brings unique experiences, attributes, and merits to the organization. If we want students in Greek organizations to step up as leaders and community members, and to enact the values of their organizations, we need to dismantle some of our assumptions about what those letters mean. So when you see my letters, if you’re curious, don’t ask me if I want to party. Ask me what those letters stand for, what my organization stands for, and what I stand for. ← Oh, Racism…you are so pervasive.